Everyone who follows high school basketball in Ohio knows that the championship in the Dayton city league is almost always decided by the matchups between Dunbar and Thurgood Marshall. Two of the state’s most prominent Division II programs, the Wolverines and the Cougars met on Friday night at the University of Dayton for the first of two regular season, in-conference, meetings. Thurgood held the lead for much of the game, including leading by 14 with less than two minutes to go in the third quarter, however, Dunbar came back to win by a final score of 66-55. Behind a strong last ten minutes of play from their group of perimeter players, Dunbar was simply too quick for Thurgood Marshall on both ends of the floor, defeating the Cougars at their own style of play. For the game, sophomore wing Terrence Landers led Dunbar with 19 points, junior point guard A.J. Harris added 12 and seniors guards Willie Green and Jordan Smith each tallied 11 points. Dunbar also got good contributions from some of their other role players, including junior guard Dorianne Dawson, who scored 9 points, and sophomore post Evan Clayborne, who tallied 6 points in his first game of the season. While Harris (an early Ohio State commit), Green and Smith used their speed to get steals and penetrate into the lane offensively for layups, Landers provided the shooting spark that the Wolverines needed to keep the Thurgood Marshall defense honest. However, it might have been the play of Clayborne late in the third quarter that sparked the Wolverines win. Checking in late in the period, the 6’6 sophomore post gave a great effort on the glass for Dunbar, setting the tone for Dunbar to regain some momentum and eventually take the lead. Now that Clayborne is eligible on this Dunbar team (after sitting out the beginning of the season per OHSAA transfer rules), the Wolverines are a much more balanced team, and can now move players like Green, Landers and Smith further away from the basket back to their normal positions. While the complete perimeter unit that Thurgood Marshall counts on to win games did not have as good of a second half as they needed to win the game, the Cougars still got excellent production from senior wing Tremaine Hawkins. The leading scorer in the game, Hawkins totaled 22 points on the night, including 17 points in the first half. As he continues to tear up the competition this year, Hawkins has shown Triple Double Prospects in three separate outings this season that he is finally ready to live up to the lofty expectations set for him as a sophomore by coaches in the Dayton area. The 6’3 wing has scoring ability from all three levels as a long distance shooter, pull-up shot-maker and a deceptive athlete who can finish around the rim with a dunk. 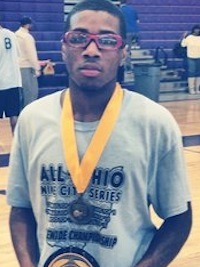 While more and more junior college coaches in the area learn his name, look for Hawkins to quickly become one of the most highly coveted senior prospects in the Dayton area. Thurgood Marshall also got double-figure points from their star sophomore post player, Derrick Daniels, who finished with 10 points while also tallying a number of rebounds and blocked shots. Senior guards RaChaun Martin, Davion Ashe, Dwayne Chastain, Jordan Jones and sophomore guard D.J. Hoskins didn’t have their greatest games individually, but each had their moments where they showed why they’re each some of Ohio’s most highly regarded guard prospects. For now, Dunbar holds the lead in the standings in the Dayton city league, and will have bragging rights over Thurgood Marshall until at least February, when the two meet again. However, rest assured that when the first weekly A.P Poll rankings for the state of Ohio are released next week you’ll see Dunbar and Thurgood Marshall both among the top ten in Division II, meaning that there’s bound to be some more late season drama between these two programs. Check back with Triple Double Prospects later this weekend when we bring you full coverage from the Scholastic Play-By-Play Classic in Cleveland.